At one time it took the addition of a 50 gallon drum and maybe an old car as targets to make a driving range fun. Technology is taking that a whole lot further. Range and practice centre operators will tell you that novelty of just hitting a bucket of balls into the field tends to wear off pretty quickly for many customers. Sure, there are those grinding on changes in their golf swing, or grooving it for their next tournament, but that hardly makes up the majority of customers. Thus, the barrels and targets over the years. A favourite of mine back in the day was a range that dropped an old school bus in at the 200-yard mark. You can imagine the clamouring to be the first to knock out a window before they were all gone! The massive success of facilities like TopGolf are proving there is a future market for golf-based entertainment facilities, so current establishments have to keep adding more features to appeal to the user, to keep them engaged. Additions like PowerTee, which automates the golf ball setup have helped, but the need for something more comprehensive to assist the already established facility (without having to spend $15-25 million to build a TopGolf) has been an opportunity waiting for a saviour. 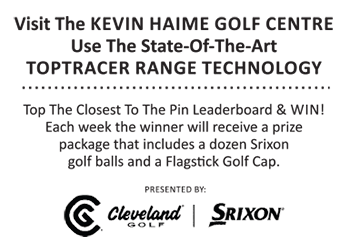 TrackMan, the company that makes Doppler Radar based tracking devices (for both golf and other sports) thinks they have the solution. The first practical installation of it will debut October 30th in Michigan. At Carl’s Golfland, already a very successful practice and golf retail centre in Bloomington Hills, suburban Detroit golfers will soon have access to the first TrackMan Range system in North America. Using a single radar system with an array that covers the entire 52-tee year-round setup, golfers can connect through an app and receive eight data points on each ball they hit. In season the data will also be available from the grass tee decks. Data points include Ball Speed, Launch Angle, Launch Direction, Height, Carry, Total, Side and Distance From Pin. “Imagine having your own personal TrackMan whenever you practice on the range at Carl’s Golfland. Starting Monday that will be possible. We are extremely happy that TrackMan choose Carl’s Golfland as the first range in America to offer this cutting-edge technology to our customers”, comments owner Carl Rose. For now users of the system can use them app to compare and contrast their results with their friends that join them on the range, but TrackMan executives have hinted at future app features that include games, and much more. More engagement, more fun. This first step seems to be just that, but it looks like it is laying the groundwork for something even better. And that leaves you wondering what the potential for technology might be in transforming current golf practice facilities into something more appealing for the future generation. Will it change the game forever and brings millions of new golfers to the sport? That might be far-reaching but any progress towards that, is just that – progress. It’s all we can hope for those who want to see the game thrive.